Vitamin D Day – 2nd Nov 2014 Nov 2nd 2014, is marked as the World Vitamin D day to recognize Vitamin D deficiency as a Global problem. Researchers agree. 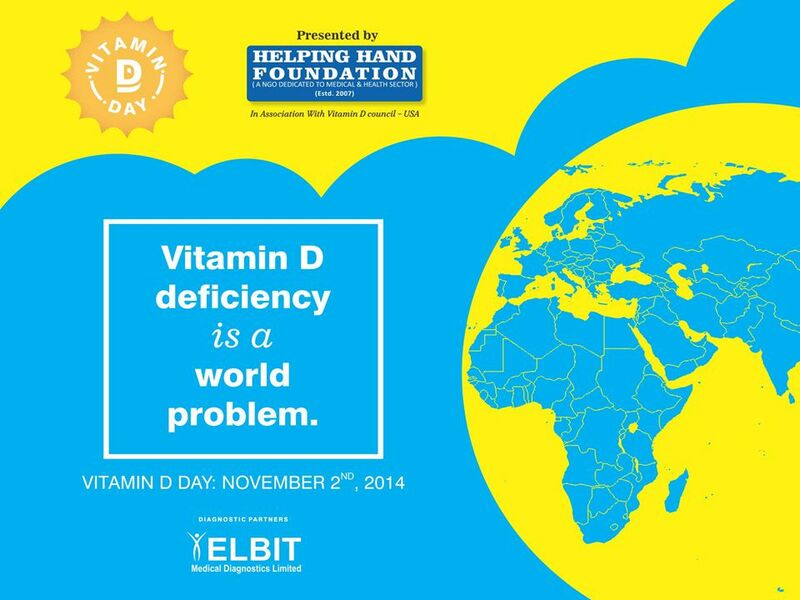 2 Vitamin D Day – 2nd Nov 2014 Nov 2nd 2014, is marked as the World Vitamin D day to recognize Vitamin D deficiency as a Global problem. 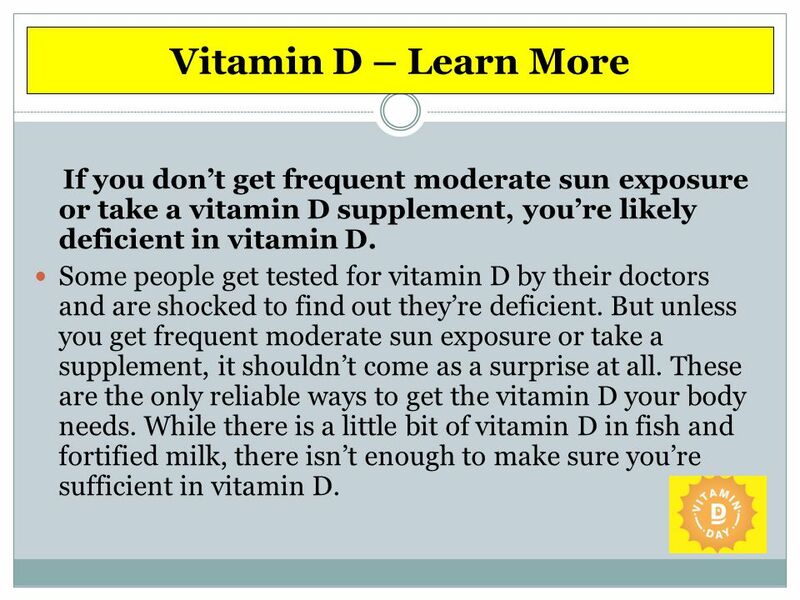 Researchers agree that at least 1/3rd of the world population is deficient in Vitamin D. So why are so many people deficient you might ask? It’s simple – we get Vitamin D from Sun exposure and now more than ever, the world’s population lives an indoor lifestyle, avoiding the sun daily. Helping Hand Foundation a city based NGO specializing in Medical & health for the undeprivledged along with ELBIT Diagnostics & Radio City 91.1 have come together to mark the importance of this day by organizing a campaign to educate & encourage people in Hyderabad about the importance of Vitamin D for our good health. A week long campaign is being organized wherein people will be encouraged to get their Vitamin D test done at a special price of Rs 1250/- which includes free consultation with the doctor. The patients who have undergone test will be counselled and guided for improving & correcting there Vitamin D levels during this week. 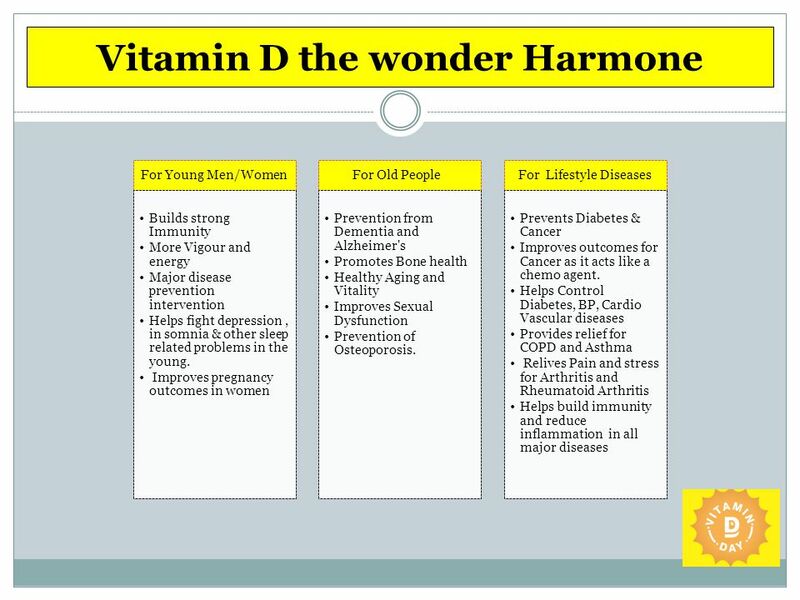 The Vitamin D Council, USA of which Helping Hand Foundation is its member is providing all the technical support and knowhow for this campaign. 3 So what is gone wrong with us? 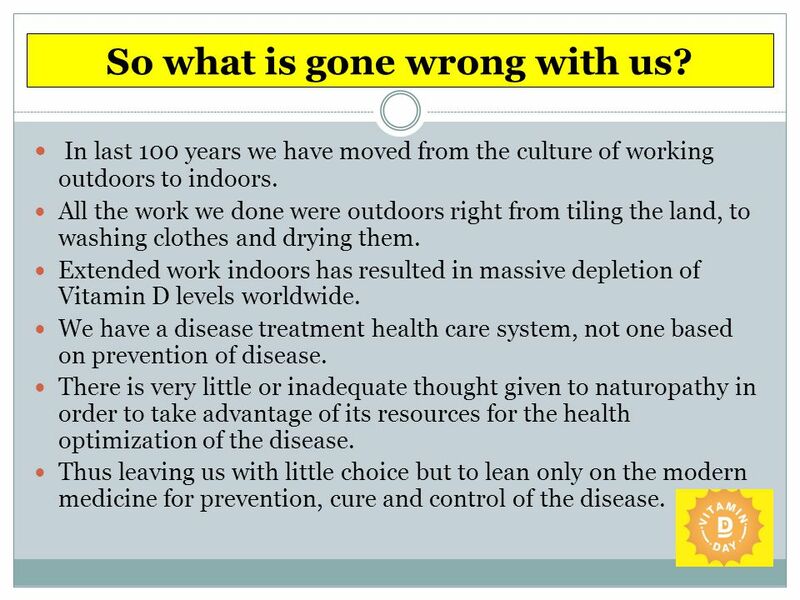 In last 100 years we have moved from the culture of working outdoors to indoors. All the work we done were outdoors right from tiling the land, to washing clothes and drying them. 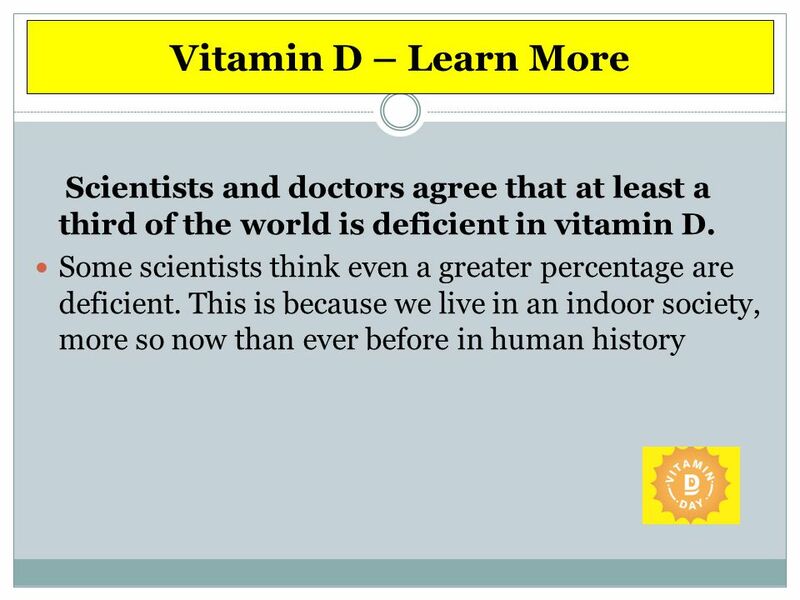 Extended work indoors has resulted in massive depletion of Vitamin D levels worldwide. We have a disease treatment health care system, not one based on prevention of disease. There is very little or inadequate thought given to naturopathy in order to take advantage of its resources for the health optimization of the disease. Thus leaving us with little choice but to lean only on the modern medicine for prevention, cure and control of the disease. 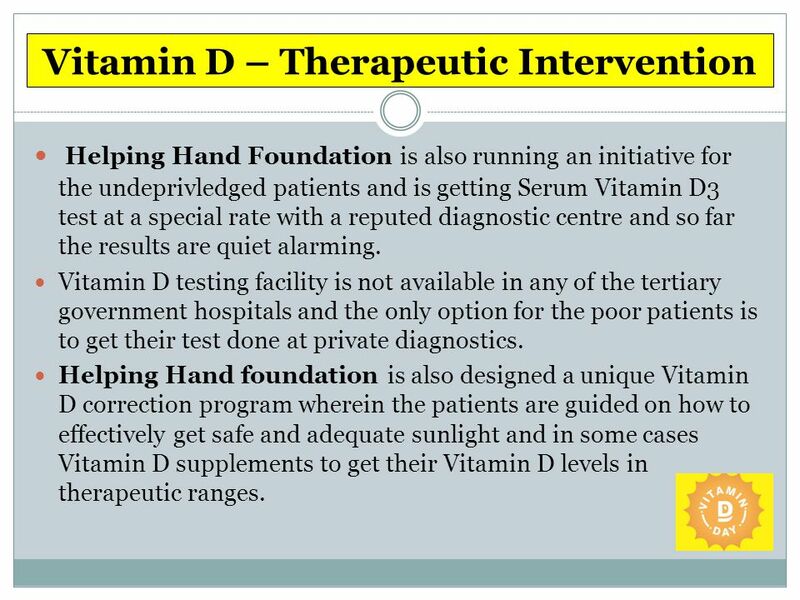 Helping Hand Foundation is also running an initiative for the undeprivledged patients and is getting Serum Vitamin D3 test at a special rate with a reputed diagnostic centre and so far the results are quiet alarming. Vitamin D testing facility is not available in any of the tertiary government hospitals and the only option for the poor patients is to get their test done at private diagnostics. Helping Hand foundation is also designed a unique Vitamin D correction program wherein the patients are guided on how to effectively get safe and adequate sunlight and in some cases Vitamin D supplements to get their Vitamin D levels in therapeutic ranges. 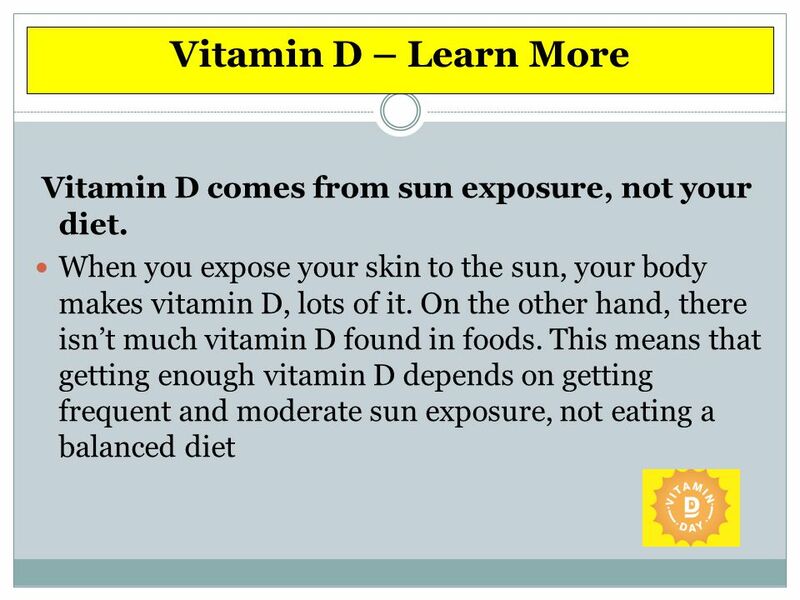 8 Vitamin D – Learn More If you don’t get frequent moderate sun exposure or take a vitamin D supplement, you’re likely deficient in vitamin D. Some people get tested for vitamin D by their doctors and are shocked to find out they’re deficient. But unless you get frequent moderate sun exposure or take a supplement, it shouldn’t come as a surprise at all. These are the only reliable ways to get the vitamin D your body needs. While there is a little bit of vitamin D in fish and fortified milk, there isn’t enough to make sure you’re sufficient in vitamin D.
9 Vitamin D – Learn More Moderate midday sun exposure is the best for making vitamin D. In order to make vitamin D, the sun needs to be high up in the sky, high enough so that your shadow is shorter than you. If your shadow is longer than you, the sun isn’t intense enough to help your body make vitamin D. Midday sun exposure is best; this is when the sun is high and your shadow is shorter than you are. 10 Vitamin D – Learn More Moderate midday sun exposure is the best for making vitamin D. In order to make vitamin D, the sun needs to be high up in the sky, high enough so that your shadow is shorter than you. If your shadow is longer than you, the sun isn’t intense enough to help your body make vitamin D. Midday sun exposure is best; this is when the sun is high and your shadow is shorter than you are. 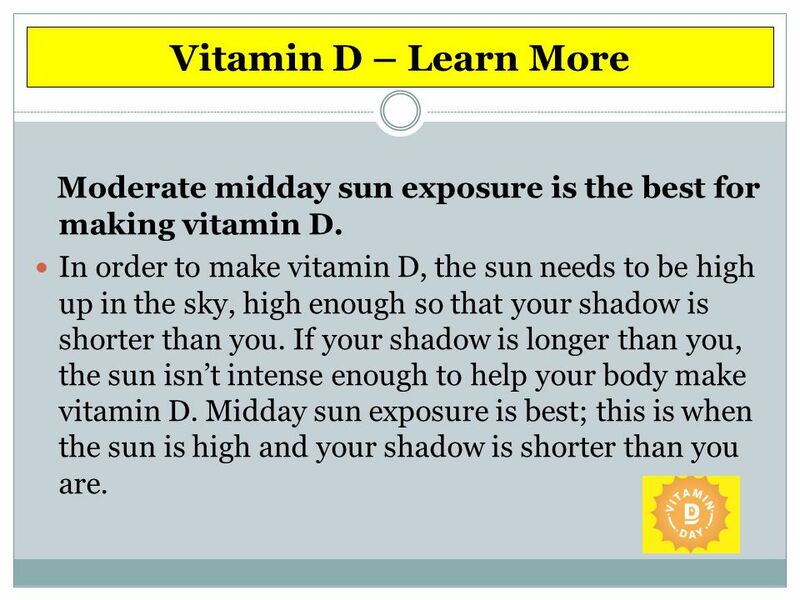 11 Vitamin D – Learn More You don’t need to burn to make vitamin D.
MYTH: GETTING A LOT OF SUN EXPOSURE ONLY ON THE WEEKENDS IS GOOD SUN EXPOSURE BEHAVIOR. It is important to get consistent, sensible sun exposure each day. Try to get minutes of midday sun exposure each day, instead of ‘catching up’ on the weekend with hours of unprotected exposure. 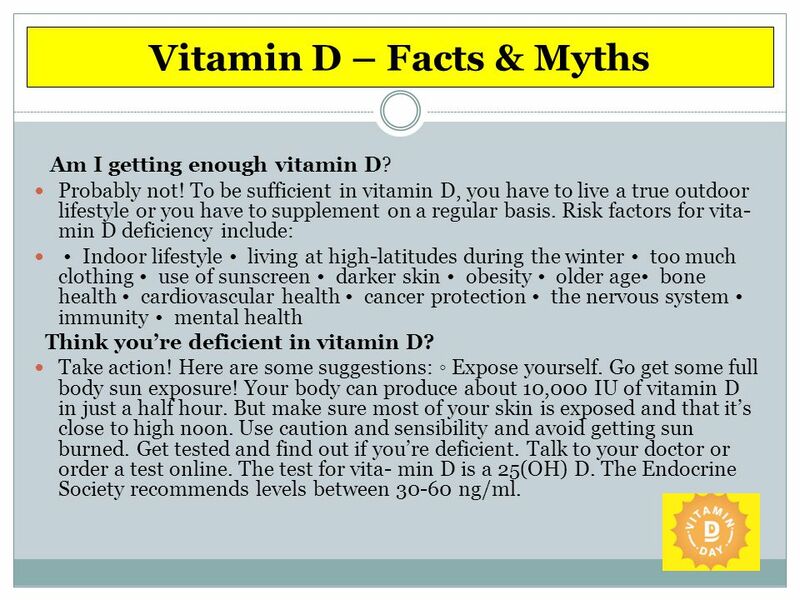 MYTH: VITAMIN D IS ONLY IMPORTANT FOR BONE HEALTH. Vitamin D is important for your bones, but researchers are discovering that vitamin D may play a role in almost every area of health. 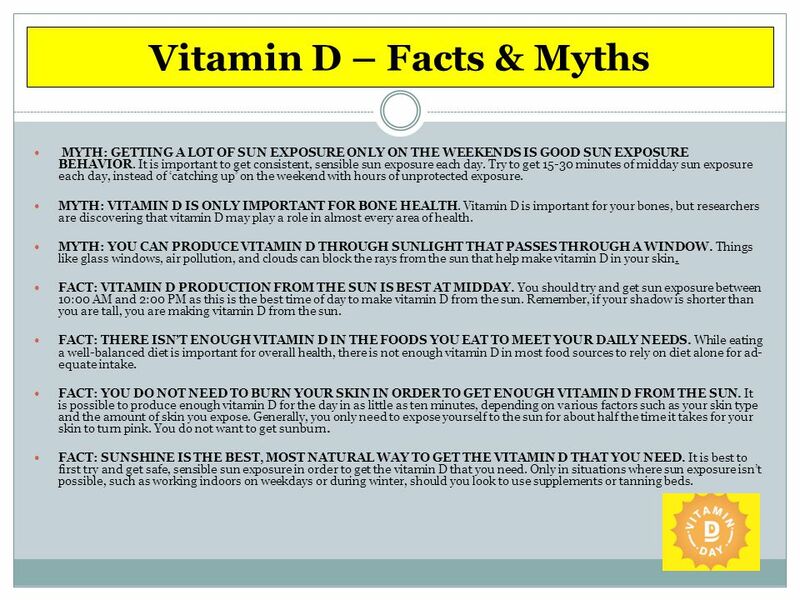 MYTH: YOU CAN PRODUCE VITAMIN D THROUGH SUNLIGHT THAT PASSES THROUGH A WINDOW. Things like glass windows, air pollution, and clouds can block the rays from the sun that help make vitamin D in your skin. FACT: VITAMIN D PRODUCTION FROM THE SUN IS BEST AT MIDDAY. 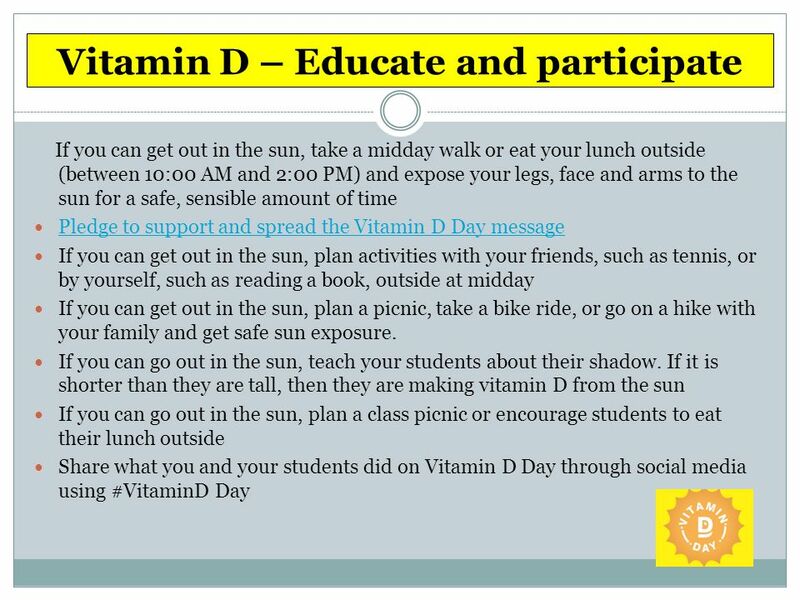 You should try and get sun exposure between 10:00 AM and 2:00 PM as this is the best time of day to make vitamin D from the sun. Remember, if your shadow is shorter than you are tall, you are making vitamin D from the sun. FACT: THERE ISN’T ENOUGH VITAMIN D IN THE FOODS YOU EAT TO MEET YOUR DAILY NEEDS. While eating a well-balanced diet is important for overall health, there is not enough vitamin D in most food sources to rely on diet alone for ad- equate intake. 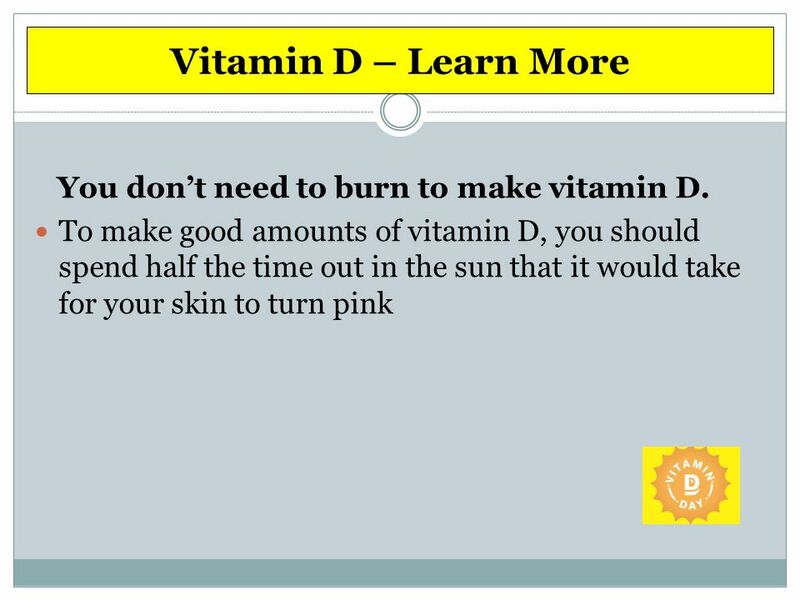 FACT: YOU DO NOT NEED TO BURN YOUR SKIN IN ORDER TO GET ENOUGH VITAMIN D FROM THE SUN. It is possible to produce enough vitamin D for the day in as little as ten minutes, depending on various factors such as your skin type and the amount of skin you expose. Generally, you only need to expose yourself to the sun for about half the time it takes for your skin to turn pink. You do not want to get sunburn. 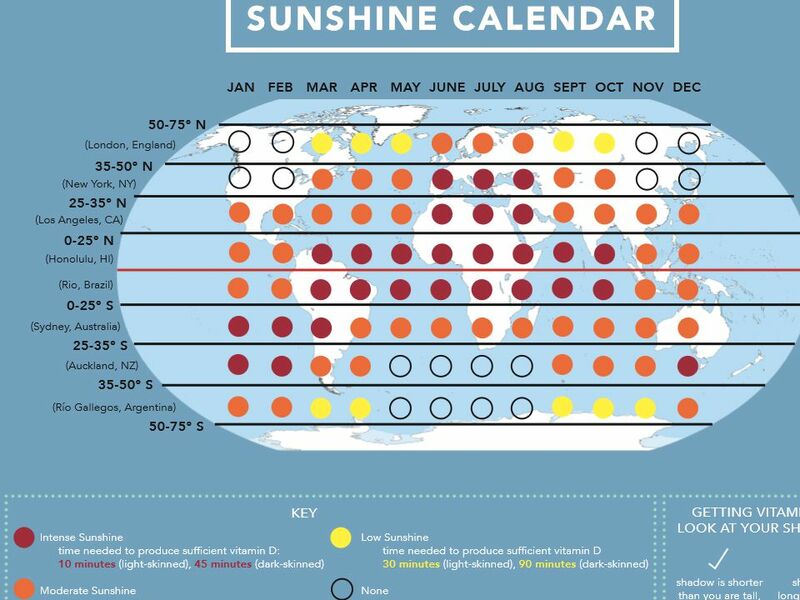 FACT: SUNSHINE IS THE BEST, MOST NATURAL WAY TO GET THE VITAMIN D THAT YOU NEED. It is best to first try and get safe, sensible sun exposure in order to get the vitamin D that you need. Only in situations where sun exposure isn’t possible, such as working indoors on weekdays or during winter, should you look to use supplements or tanning beds. Am I getting enough vitamin D? Probably not! To be sufficient in vitamin D, you have to live a true outdoor lifestyle or you have to supplement on a regular basis. Risk factors for vita- min D deficiency include: • Indoor lifestyle • living at high-latitudes during the winter • too much clothing • use of sunscreen • darker skin • obesity • older age• bone health • cardiovascular health • cancer protection • the nervous system • immunity • mental health Think you’re deficient in vitamin D? Take action! Here are some suggestions: ◦ Expose yourself. Go get some full body sun exposure! Your body can produce about 10,000 IU of vitamin D in just a half hour. But make sure most of your skin is exposed and that it’s close to high noon. Use caution and sensibility and avoid getting sun burned. Get tested and find out if you’re deficient. Talk to your doctor or order a test online. The test for vita- min D is a 25(OH) D. The Endocrine Society recommends levels between ng/ml. 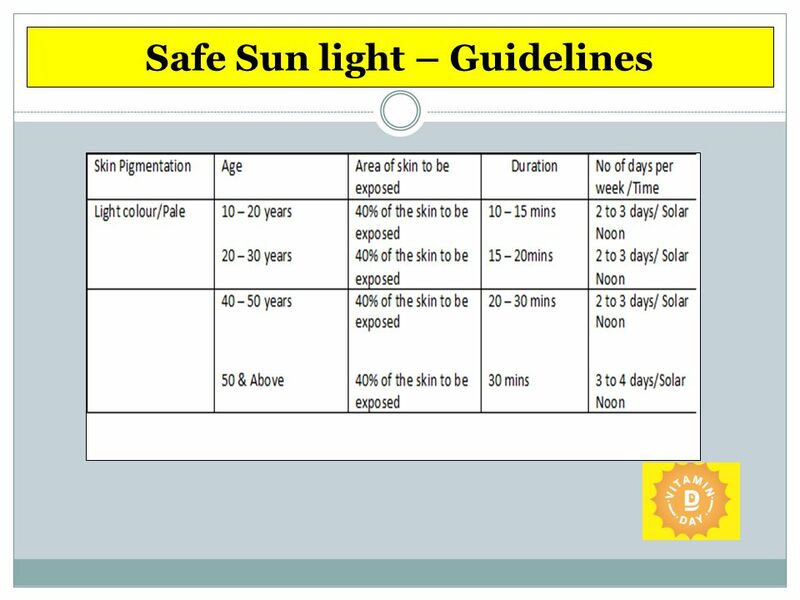 The darker the skin pigmentation the more the time body will take to make Vit D. Add at a minimum 15 mins under each of the above categories of age if you are darkly pigmented Face and eyes to be covered – preferably use cap Best time for Sun Light exposure is Solar Noon ( 10 am to 2pm IST) – remember the thumb rule your shadow should be shorter than yourself. DONOT TAKE SHOWER IMMEDIATELY AFTER TAKING SUN EXPOSURE IT TAKES 48 HRS FOR THE BODY TO ABSORB VIT D – SO AVOID WASHING WITH SOAP THE AREAS EXPOSED TO SUNLIGHT. 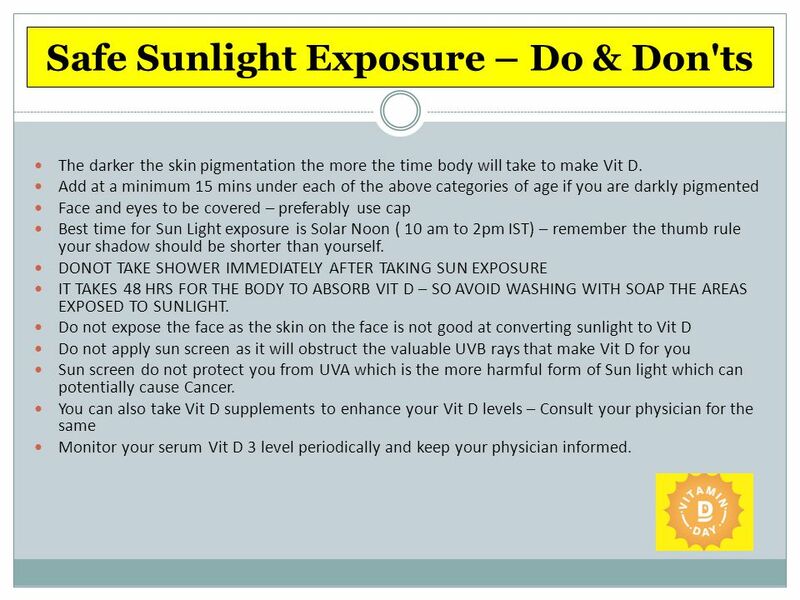 Do not expose the face as the skin on the face is not good at converting sunlight to Vit D Do not apply sun screen as it will obstruct the valuable UVB rays that make Vit D for you Sun screen do not protect you from UVA which is the more harmful form of Sun light which can potentially cause Cancer. You can also take Vit D supplements to enhance your Vit D levels – Consult your physician for the same Monitor your serum Vit D 3 level periodically and keep your physician informed. 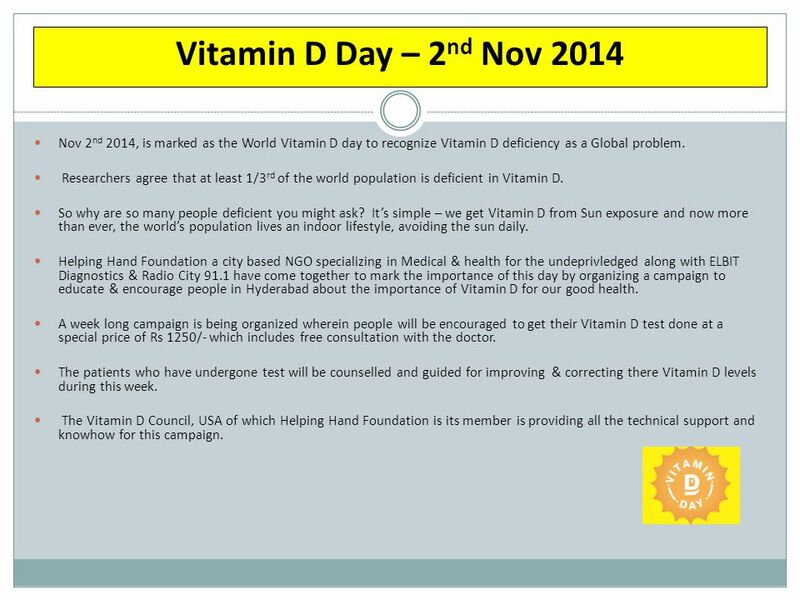 Download ppt "Vitamin D Day – 2nd Nov 2014 Nov 2nd 2014, is marked as the World Vitamin D day to recognize Vitamin D deficiency as a Global problem. Researchers agree." Light Up Your Health. Light Goes A Long Way By adding sunlight and other types of light to your everyday activities you can help to: –Lose Weight –Sleep. By: Rachel Hoendorf. Since the use of tanning facilities has increased, professional tanning consultants work to promote balance and educate users about. What You Need to Know about Vitamin D Kelly Forrest, R.N. 10 little things that make a BIG difference. Source: National Highway Traffic Safety Administration, CBS Health Watch, & The House Ear Institute. 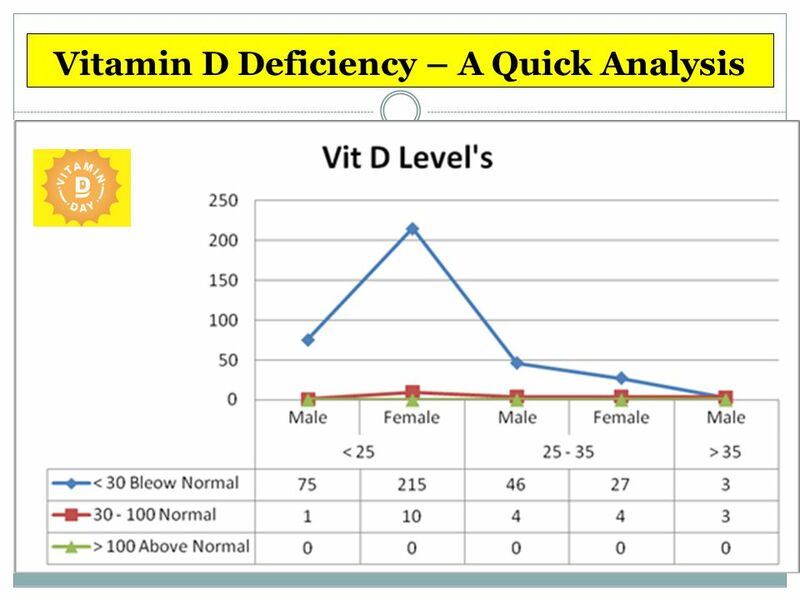 Vitamin D Deficiency Elaine Wendt, MD January 4, 2010. Vitamin D Deficient Rickets: A Disease of the Past? SunGuard Your Skin A Lesson About Sun Safety Learning Objectives At the completion of this program, students will be able to:  Identify three negative. The ‘Wonder’ Vitamin ALTAF VAIYA. 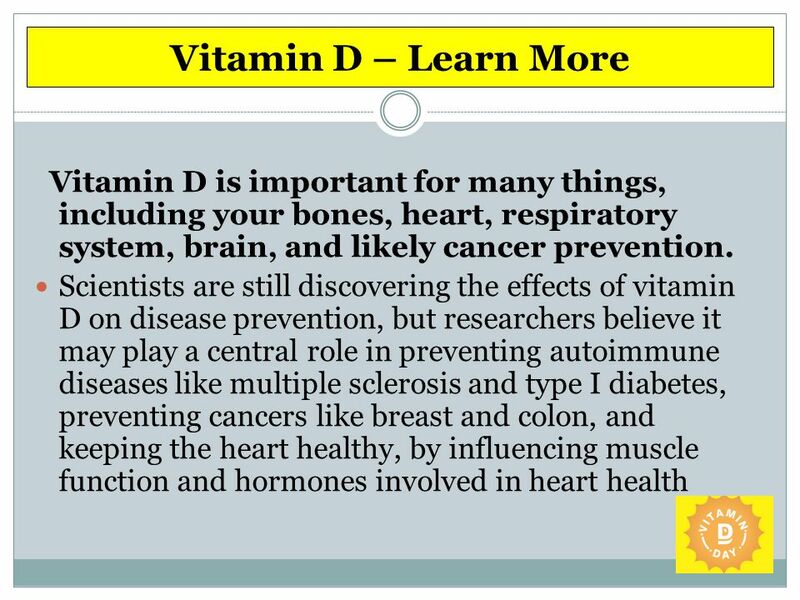 Vitamin D is essential… “To maintain good health...” “To maintain good health...” -regulates levels of calcium and phosphate. Move to Lose. Lose and Win Session 2 Objectives Understand the benefits of physical activity. Review common exercise myths. Understand the role of physical.